The single most important event in the history of country music.' 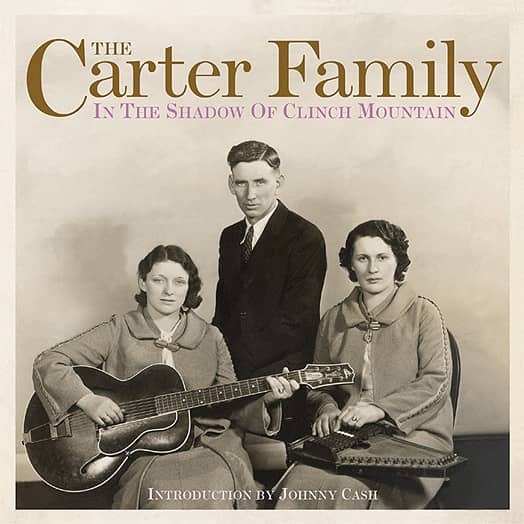 That was how Johnny Cash characterized the first Carter Family session in Bristol, Tennessee in 1927. 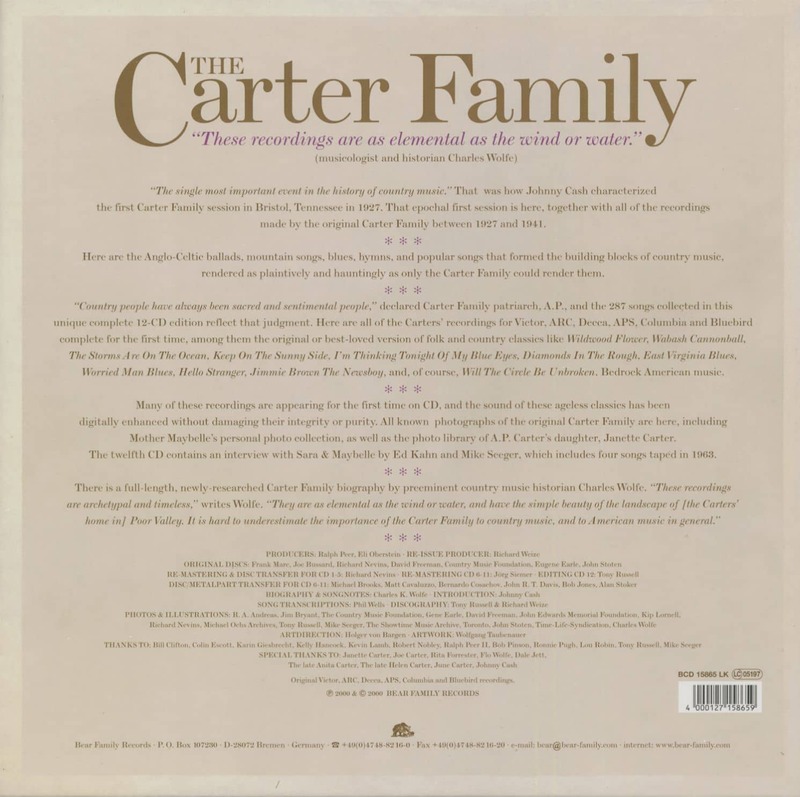 That epochal first session is here, together with all of the recordings made by the original Carter Family between 1927 and 1941. 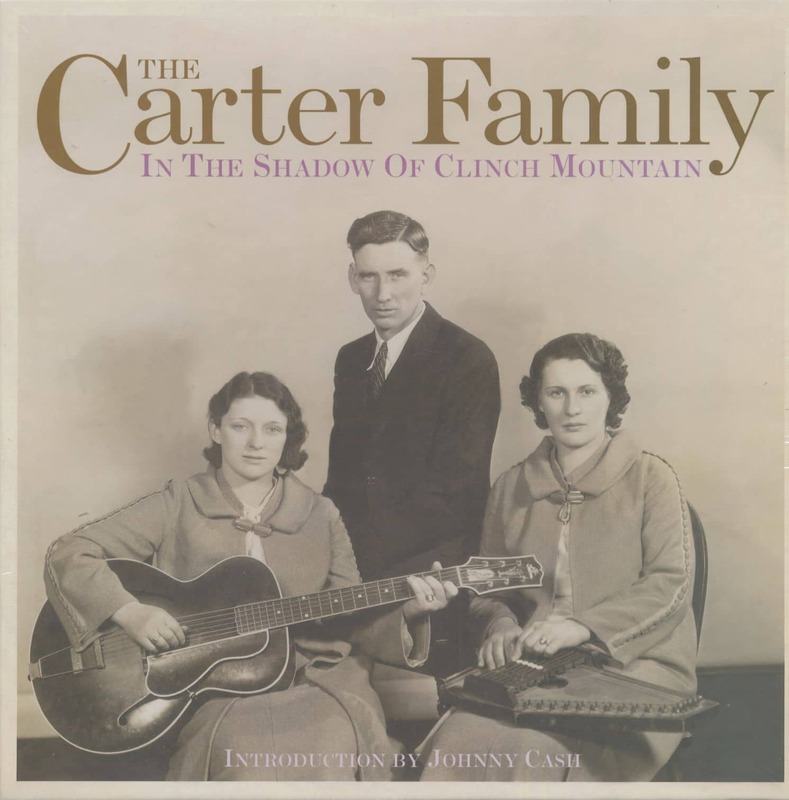 Here are the Anglo-Celtic ballads, mountain songs, blues, and popular songs that formed the bedrock of country music, rendered as plaintively and hauntingly as only the Carter Family could render them. Country people have always been sacred and sentimental people,' declared Carter Family patriarch, A.P., and the 307 songs collected in this unique complete 12-CD edition reflect that judgement. This collection includes all of the Carters' recordings for Victor, ARC, Decca, APS, Columbia and Bluebird complete for the first time. Here are the original versions of country and folk classics like Wildwood Flower, Wabash Cannon Ball, The Storms Are On The Ocean and, of course, Will The Circle Be Unbroken. 07 Where Shall I Be? 01 Will My Mother Know Me There? A traveler coming out of Kingsport, Tennessee and into the border town of Gate City, Virginia could easily miss the turn-off; it is a narrow, two-lane blacktop that wanders over to the mountains in the east, and is currently named highway 58. Where it runs into the Kingsport highway there are two signs to help guide the traveler; one says 'To Hiltons' and the other says 'Carter Fold' with an arrow. Hiltons the traveler can find on his map, a small village beneath what the locals call Pine Ridge. But when you get to Hiltons, you leave 58 and make a swing up to the northeast on an even smaller highway, county route 614. Now you are going northeast, down a long verdant valley with the towering Clinch Mountain on your left and the rest of Pine Ridge on your right, to the south. Soon a sign appears reading 'A.P. Carter Highway.' A casual tourist might wonder about this. Who was A.P. Carter? A local politician? A legendary frontiersman? A war hero? One of those local characters who manage to get roads and bridges named after them? But any visitors who know the slightest thing about music don't have to wonder. They nod with recognition when they see the name, and many begin to hum a song that they associate with the name. They know that A.P. Carter was not a politician nor a bear hunter nor a war hero. He was more important than any of those -- he was a singer and a songwriter and a song collector, and what he and his wife and his wife's cousin did in this valley some seventy years ago was to help change the face of American music. A few miles past the sign, the traveler comes into a community called Maces Spring; on the official maps and mail routes, it is listed as 'Spring' in the singular, but all the locals call it 'Springs,' in the plural. To the left a big barn-like building stands right on the road, and it is here that the children of A.P. Carter every week stage shows to celebrate his style of music. Past the barn is a small country store, built by A.P. when he retired from music in the 1940s, and which is today a small, gem-like museum. Here the visitor can see copies of the old Victrola records from the 1920s that won the Carter Family their initial fame; here they can see the old Underwood typewriter that A.P. used to write down the words to songs he collected; here are the dresses the two women wore, and the dusky suit that A.P. used. There are no rhinestones here, no Nudie specials with stripes and piping. 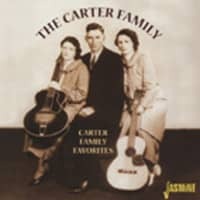 It is a museum as simple and unassuming as a Carter Family song. Further down the road, and up a crooked little driveway to the top of a hill, is the Mt. Vernon United Methodist Church. It's been modernized and remodelled, but it still looks a lot like it did 90 years ago, when A.P. Carter attended here and added his odd bass voice to the singing. Like many rural churches, Mt. Vernon keeps its cemetary out behind the main building, and it is here that two of the Carters rest: A.P., who died in 1960, and his wife Sara, who died in 1979. Maybelle, who died in 1978, rests in Hendersonville, Tennessee. Back down on the road, you can see the houses they all lived in, still in fine shape, still occupied, in some cases by Carter relatives. What strikes one is how close together all these places are, all within walking distance, all tucked in the valley between two huge mountains. It is an unassuming place to be the locus of such creativity and such artistry, to be the source of such a large part of classic American music. The highway itself goes on to the east, to a hamlet called Mendota, but for musicians and lovers of music, Maces Spring is as far as it goes. Here is the wellspring; here is the energy; here are the ghosts. 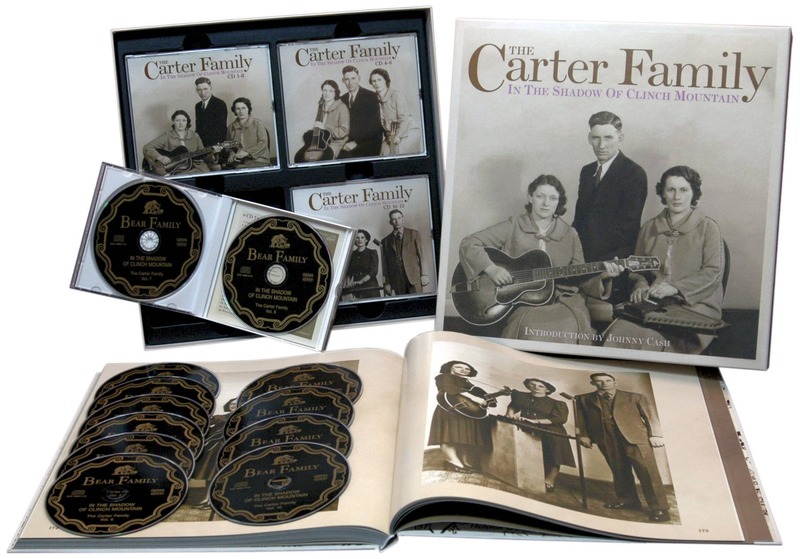 Here, after all, was where the journey began, where a singing trio named The Carter Family forged a music that would change the face of American culture. It was here, when the 20th century was still bright and new, that these three remarkable people forged their plans: to take the old mountain music of their fathers and mothers and cousins and uncles and make it appealing to a general audience, and adapt it to the new mass media of the age, records and radio. It is here, in the shadow of the Clinch Mountain that he wrote about in so many of his songs, that A.P. and Sara and Maybelle began their journey. They called the valley Poor Valley, though no one could remember exactly why. A.P. used to joke that it was called that because there were so many poor people in it. In the 1920s, much of the valley remained as it had been for years, lush with crops and heavy timber. People lived much as their grandparents had, an easy day-to-day life that was only starting to be impacted by the new cash economy. It was an ideal setting for the preservation of the old traditional music, a bucolic vale that called up Wordsworth's images of a bird-haunted English countryside. And yet the valley was surrounded by elements of the new 20th century technology that were making their way into the mountains. A few miles to the northwest, at Big Stone Gap and Appalachia and Norton, the coal mines were in full gear, and the young mountain boys were finding work in the mines and living in company towns. A few miles to the southwest, just over the Tennessee line, the new town of Kingsport was bringing serious industry to the region. Kingsport was an early 'planned town,' created about 1917 by the CC & O (Carolina, Clinchfield, and Ohio) Railroad and was an early cross between a company town and a structured model city. An industrial hub from the beginning, it had acquired by 1927 ten industries and over 3,000 jobs. Many of these were at the giant Eastman (Kodak) plant, which worked on the cutting edge of applied technology, and during World War II had started the Holston Army Ammunition Plant, which became the largest such facility in the world. It was really Kingsport that was closer to the Carter homestead than Bristol or Johnson City, and in 1927 it was a new, bustling community that was paving the way for a new mountain economy. Carters had been all up and down the valley since the Revolutionary War; there were as many as four separate families of Carters, leading to more than a little historical confusion. It does appear, though, that one Thomas Carter, a relative of A.P. 's, was in the valley by 1784 when he built Carter's Fort, an outpost on the old Wilderness Road near present-day Ryecove. On December 15, 1891, two more Carters, Robert and Mollie Carter, saw the birth of the first of what would be eight children: he was Alvin Pleasant Delaney Carter, known as Doc for short. As the boy grew, he heard his mother sing old ballads like The Brown Girl, and his father sing the gospel songs of the mountain churches. He was a bright, inquisitive lad, but from the start suffered from a minor physical affliction in the form of a slight palsy which made his hands shake. His mother wondered about this, and in later years told her grandchildren a story that she thought explained it. About two months before A.P. was born, she had been up on the mountain picking up apples when a sudden thunderstorm came up. Lightning began to flash, and before she could seek shelter, a bolt struck the ground right next to her. It somehow affected the unborn child -- it "marked" him, as she said -- and when A.P. was born, he had the palsy. In later years, this did affect his ability to play the fiddle as well as he might have, and on occasion interfered with his ability to keep good rhythm on the guitar. Customer evaluation for "In The Shadow Of Clinch Mountain (12-CD)"